Once upon a time, way back in 1981, long before the internet… Will Friedwald and I teamed up to produce the blue book on the left – the first Looney Tunes filmography, The Warner Brothers Cartoons published by Scarecrow Press. The green book in the center is the same book (with a new Introduction) reprinted in 1997 (and still available!). 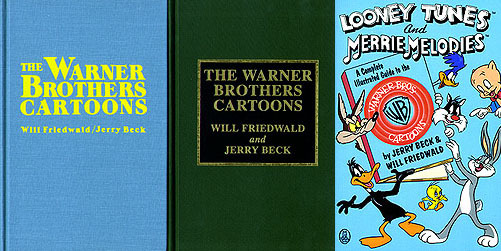 To the right is the “bible” of Warner Bros. cartoons, the revised edition published by Henry Holt in 1989 – Looney Tunes And Merrie Melodies: A Complete Illustrated Guide To The Warner Bros. Cartoons – its long out of print, you better grab a copy if you can find it. I TAWT I TAW A PUTTY TAT (above left) was published in 1991 by Henry Holt in hardcover and softcover. It is out of print, but you can check ebay and amazon.com for a used copy. THE 50 GREATEST CARTOONS (center) was published in 1994 by Turner Publishing. It can still be found in bargain book stores if you look hard, under the “JG Press” imprint. Amazon.com is selling it here. WARNER BROS. 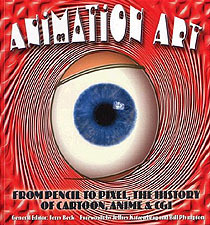 ANIMATION ART was published in 1997 by Hugh Lauter Levin Publishers. It was also reprinted under the “Beaux Arts Editions” imprint. Both those editions features a faux “cel” imbetted in the cover. The latest reprint, with a normal “flat” cover under the Barnes & Noble Books imprint, can be found (if you’re lucky) in the bargain bins for $15 bucks. 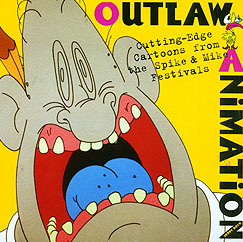 OUTLAW ANIMATION (2003) from Harry N. Abrams is long out of print – but available for as little as 14 cents on Amazon.com. It’s the story behind the Spike and Mike Animation Festivals with interviews and art from Mike Judge, John Lasseter, Andrew Stanton, Bill Plympton, Don Hertzfeldt, Craig McCracken, Peter Lord, and others. It’s one of my best books. Well worth 14¢. 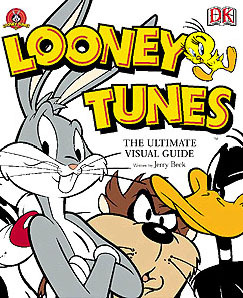 LOONEY TUNES: THE ULTIMATE VISUAL GUIDE (2003) from Dorling Kindersley. Everything ever wanted to know about Bugs Bunny, Daffy Duck and hundreds of other characters – lavishly illustrated. 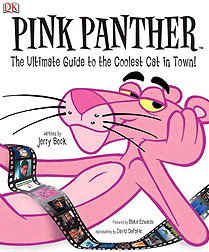 PINK PANTHER: THE ULTIMATE GUIDE (2005) from Dorling Kindersley is the ultimate resource of all things Clouseau, all things DePatie Freleng, all things Pink Panther. This highly illustrated book covers all the Panther cartoon shorts, The Inspector cartoons, Roland & Ratfink, Tijuana Toads, Ant & The Aardvark, Hoot Kloot, Blue Racer, The Dogfather, Crazy Legs Crane, Misterjaw, and much much more. The book covers all ten Clouseau live action movies including the one with Alan Arkin, and the new one with Steve Martin. The book covers the Saturday Morning TV shows, the merchandising and the comic books. And everything else! It’s the coolest book you’ll ever own! 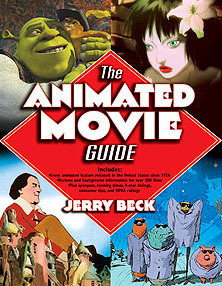 THE ANIMATED MOVIE GUIDE (2005) is the ultimate illustrated reference to cartoon, stop-motion, and computer-generated feature films. Going beyond the box-office hits of Disney and Dreamworks, this guide to every animated movie ever released in the United States covers more than 300 films over the course of nearly 80 years of film history. Well-known films such as Finding Nemo and Shrek are profiled, as well as hundreds of other films, many of them rarely discussed, are analyzed, compared, and catalogued. The origin of the genre and what it takes to make a great animated feature are discussed, and the influence of Japanese animation, computer graphics, and stop-motion puppet techniques are brought into perspective. Every film analysis includes reviews, four-star ratings, background information, plot synopses, accurate running times, consumer tips, and MPAA ratings. Appendices, guides to made-for-TV movies, direct-to-video releases, foreign films that were never theatrically released in the U.S., and live-action films with significant animation round out the volume. Written by Jerry Beck and his expert associates – Martin Goodman, Andrew Leal, W.R. Miller and Fred Patten – The Animated Movie Guide, is a 400 page trade paperback published by the Chicago Review Press. It’s going out of print – order it Amazon.com right now. When I worked for Harvey Entertainment in 1993-94, I discovered they had proofs (“silverprints”) of all the original artwork for Harvey Comics dating back to 1952. These early comics of Casper, Richie Rich, Hot Stuff, Baby Huey, Little Audrey and others were amazing! The linework, the inking, the drawings, the stories. They felt like animated cartoons – and that was because they had been written and drawn by artists at Paramount’s Famous Studios. For years I tried to get this material reprinted. At last, thanks to the folks at Classic Media, Dark Horse publishing, and my collaborator/editor Leslie Cabarga, this incredible work is finally being reprinted. And I had the privilege to write an introduction for each volume. All five volumes (published between 2007-2009) are on sale now. Buy them all! They are great! THE ART OF BEE MOVIE (publication date: October 4th, 2007) The new Dreamworks Animation movie written, produced and starring Jerry Seinfeld! Here is the cool behind the scenes production art that created the beehive, Central Park, Manhattan and the incredible characters. Chronicle Books (they do all the Pixar “Art of” books) has outdone themselves with this lavish volume. NOT JUST CARTOONS: NICKTOONS! (publication date: October 29th, 2007) This is the first book to collect all thirty-one of the groundbreaking cartoons into one dynamic volume. The creators of every show open up their archives, revealing napkins scrawled with early prototypes: see SpongeBob before he started wearing pants, storyboards, one-of-a- kind cels, and more. A crazy gigantic art book for the entire family! THE HANNA BARBERA TREASURY (publication date: November 27th, 2007) This book celebrates the legacy of Bill Hanna and Joe Barbera through more than five decades of rare drawings, storyboards, concept art, and memorabilia from studio archives and private collections. It includes more than 24 removable artifacts and facsimile reproductions, as well as photographs, sketches, comic book covers, brochures, posters, vintage art, rare merchandising images, retro product packages, and archival newspaper and magazine ads! 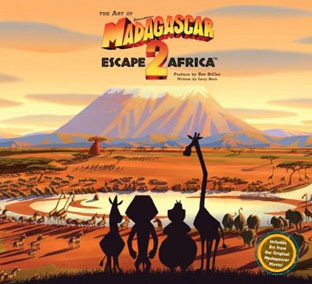 THE ART OF MADAGASCAR 2 (publication date: October 7th, 2008). Three words: Craig Kellman artwork. This book is loaded with the early sketches and beautiful production paintings that were pre-viz development for Dreamworks Madagascar and it’s sequel Madagascar Escape 2 Africa. Discover how animators incorporated animal idiosyncrasies into each character, how digital avatars were tailored to voice actors, and the inside scoop on those darn penguins. The abundance of behind the scenes visuals, information, and special features in the The Art of Madagascar is sure to drive kids and anyone’s creative curiosity wild. 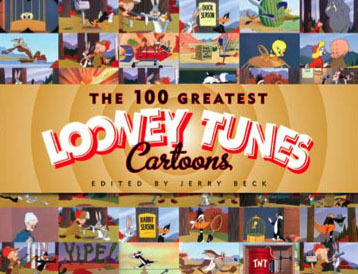 THE 100 GREATEST LOONEY TUNES CARTOONS (publication date: July 6th, 2010). Two words: Looney Tunes. Introduction by Leonard Maltin. Evaluated on their comedic brilliance, innovative animation, historical significance, and creative merit, Jerry Beck and his team of animation experts reveal the amusing anecdotes and secret origins behind such classics as What’s Opera, Doc?, One Froggy Evening, and Duck Dodgers in the 24½th Century. Featuring more than 300 pieces of original art from private collectors and the Warner Bros. archives, The 100 Greatest Looney Tunes Cartoons settles the debate on the best of the best, and poses a new question: Is your favorite one of the greatest? THE SPONGEBOB SQUAREPANTS EXPERIENCE (Published October 1st, 2013). 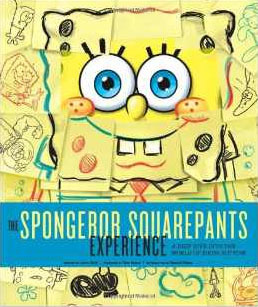 This lavish coffee table book delivers an eye-opening behind-the-scenes look at the creation of SpongeBob and all the hard work and creativity that have gone into making him one of the most popular cartoon characters of all time. Featuring in-depth interviews with the cast and crew who bring Bikini Bottom to life, The SpongeBob SquarePants Experience will also include a treasure trove of SpongeBob concept artwork and other rare and revelatory visuals that will make it an absolute delight for fans. THE ART OF DREAMWORKS MR. PEABODY AND SHERMAN (published February 11th, 2014) A behind-the-scenes look at the production art for DreamWorks Animation’s animated feature Mr. Peabody and Sherman. The story of a dog and his boy, based on the classic Jay Ward cartoon – created by Ted Key – from the old The Rocky and Bullwinkle Show. 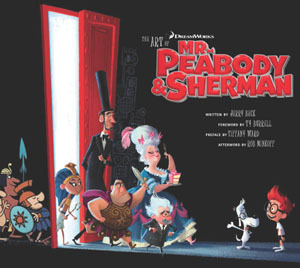 As you know, Mr. Peabody uses his WABAC – a time-traveling machine that he and his pet boy Sherman use to explore the world throughout the ages – to cross paths with the likes of Marie Antoinette and Leonardo da Vinci. But when Sherman uses the WABAC without permission, history starts to spiral out of control. The results are disastrous – and hilarious – thanks in part to a voice cast that includes Ty Burrell, Stephen Colbert, and Mel Brooks. The imaginative spirit of the film is captured here from beginning to end with concept art, character backgrounds, design inspiration, and exclusive behind-the-scenes information.